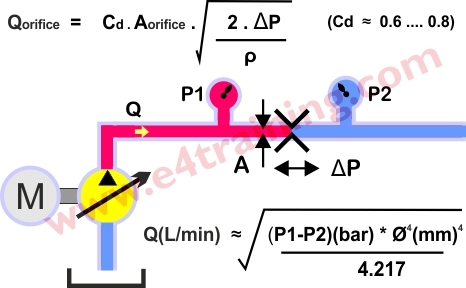 A circuit's flow rate can be set by the displacement of the pump e.g. a 10cc/rev pump running at 1500rev/min would give 10 * 1500 /60 = 250 L/min, ignoring any losses. In practice, a pump's actual displacement will vary. For a start the pump's nominal, catalogue figure is rarely exact and there will always be changes in a pump's volumetric efficiency with changes in pressure, temperature, and speed. There will also be the effect of the drive system slowing with changes in load. 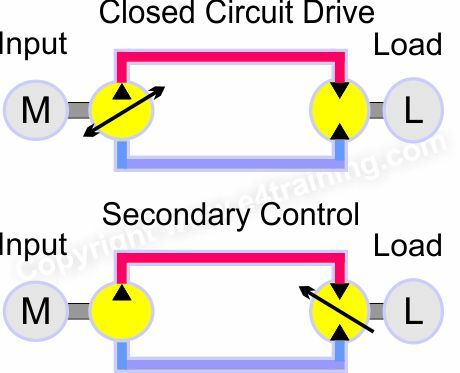 It's common for a circuit's flow to be set by the flow control (restrictor) valve in the circuit. The simple formula (shown in the diagram) can be reliably used for most sharp-edged orifice installations. In reality, there are always a large number of diameter and direction changes that will impact on performance but the reliability of this formula has been demonstrated by as significant laboratory tests and field experience data. Keeping the fluid velocity through the pipework to within normal limits is vital for ensuring good performance. Pipe sizes are calculated during the system design stage but it's important that these are not reduced during remedial work. The formula to establish the correct fluid velocity is shown in the diagram and typical values will be provided later in this training. Closed circuit systems have NO flow control valve in the main lines but instead, use the pump/motor displacement to control the speed. With no pressure loss from the flow control valves, the overall system efficiency should be higher. Modern electronics, and the need for reducing power loss throughout industry, is also bringing the use of more �secondary control' solutions into hydraulic design. These will not be discussed in this course but as engineers you should be aware that a wide range of control systems exist and may be used in your application.